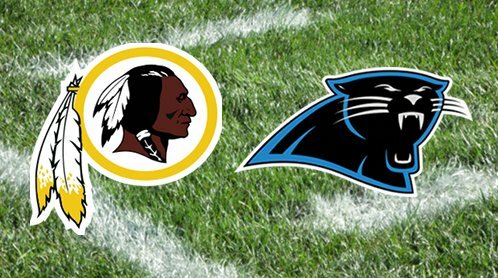 LANDOVER, MD.– The Washington Redskins fell to the Carolina Panthers 23-15 on Monday night in DC hindering their playoff hopes. The Redskins (7-6-1) now find themselves in do or die mode for the next two weeks with games at Chicago and the regular season finale at home against the Giants. 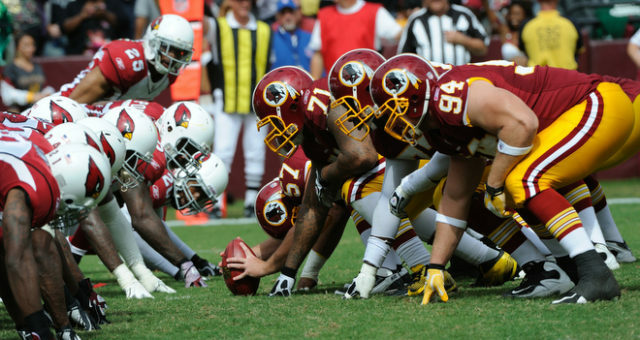 The woes for the Redskins on Monday night continued as they have lost 16 out of 17 games at home on Monday night. The Redskins offense, which has been the strong suit this season struggled to get going all game long. Kirk Cousins stat line was pedestrian at best, 29-44 for 296 yards and one interception. Kirk Cousins is still in line for a big pay raise this offseason but performances like this leave fans with a little to be desired. On the other side of the ball, Josh Norman was pretty much held in check and his name was barely called and it seems the Panthers won this round. Carolina, the reigning NFC Champions got off to a fast start and never looked back. With an early tie at three all, Cam Newton connected to Ted Ginn Jr. for a 30-yard touchdown. After another field goal by Graham Gano which made it 13-3 the Redskins had perhaps their best drive of the day. 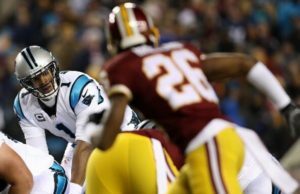 The Redskins put together a seven play 89-yard drive capped off Robert Kelley five-yard touchdown run. A Dustin Hopkins missed extra point halted any momentum the Redskins had heading into the locker room. 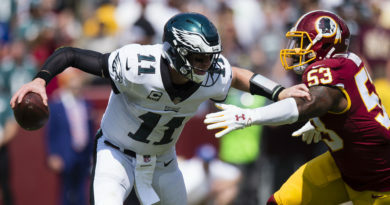 Tempers flared on both sides as during a third-quarter play in which Kurt Coleman and all pro tight end Jordan Reed got into a scuffle that led to Reed being ejected as he was caught throwing punches. Reed who clearly was hurt during tonight’s game had one catch for one yard and did not justice to fantasy owners who were looking for a big game during their playoff run. The Panthers showed flashes of a team that is one year removed from going 15-1. Jonathan Stewart who last a 100-yard game last season against this very same Redskins team during week 15. Stewart finished with 23 carries for 131 yards. Cam Newton showed a national TV audience why he was the NFL MVP last season going 21-37 for 300 yards and two touchdowns. Newton improved his record to an impressive 20-5 in December/January games including the playoffs. Washington has the second highest payroll on offense at 82.7 million, which is second to the Cowboys and has only 43.9 million allocated to the defense which is second fewest to the Panthers. The biggest issue for this team that needs to be addressed whether they make it into the postseason or not is their defense. Health and consistency are the two biggest factors that have halted their performance this season. Washington travels to Soldier Field to battle the Chicago Bears (3-11) on Christmas Eve in a true must-win situation. 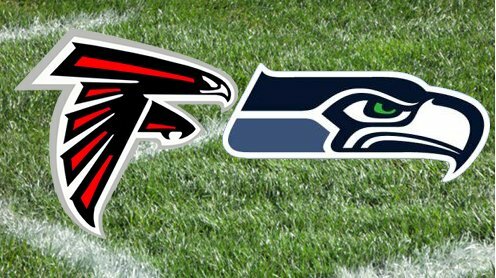 On a short week after a tough primetime loss, if they cannot find a way to beat one of the worst teams in the league, they do not deserve a postseason birth. Jay Gruden has his work cut out for him to ensure his seat can remain at least room temperature this offseason. The Green Bay Packers now have the lead for the last wildcard playoff spot, the Redskins have dropped down to eighth in the NFC standings.